President Donald Trump used his State of the Union address Tuesday night to tout “a revolution in American energy” that has made the U.S. “a net exporter” -- but some of his celebration might be premature. 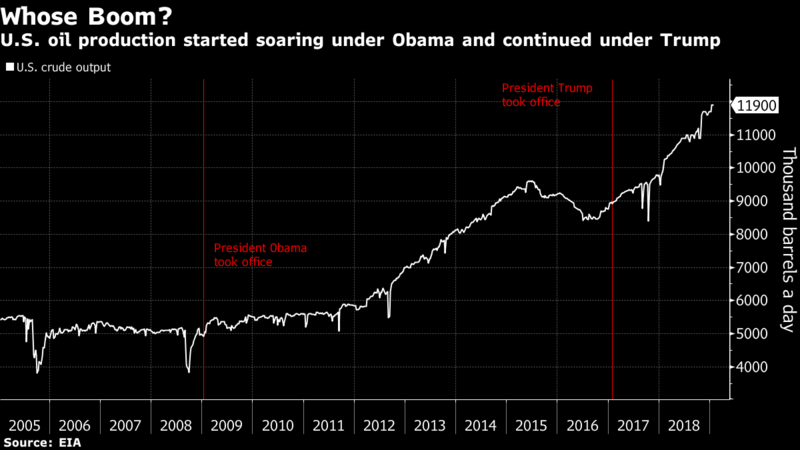 Although the U.S. briefly became a net petroleum exporter during one week last November, government analysts say it will be at least September 2020 before it claims that title on a steady basis, by shipping out more energy than it imports on an annual basis. The nation is already a net exporter of coal and natural gas. Trump’s brief salute to U.S. fossil fuel dominance -- one passing mention in a speech expected that lasted more than hour -- also invoked a milestone that was partially achieved before he won the White House, under former President Barack Obama. "The United States is now the No. 1 producer of oil and natural gas anywhere in the world," he said, provoking steady applause in the U.S. House chamber. The U.S. has been the world’s top natural gas producer since at least 2009, according to the Energy Information Administration. And it surpassed Russia as as the world’s largest crude oil producer last year (though the U.S. has led the world when it comes to a wider array of petroleum hydrocarbons since 2013). Trump’s decision to hail fossil fuels isn’t unique in this forum. Obama touted natural gas production in his 2012 State of the Union speech, back when many environmentalists welcomed it as a cleaner-burning coal alternative that could be a bridge to a lower-carbon future.